It is a Patch for FIFA09 and 10 for PC. This blog is my secondary sites to MSLPL4FIFA09/10 patch to the Game. I believe, Malaysia fan will enjoy our own local League, changing the odds of their favorite local teams. Only then it's in the game. Please be informed that I will continue all latest post in my WORDPRESS blogs instead of this. 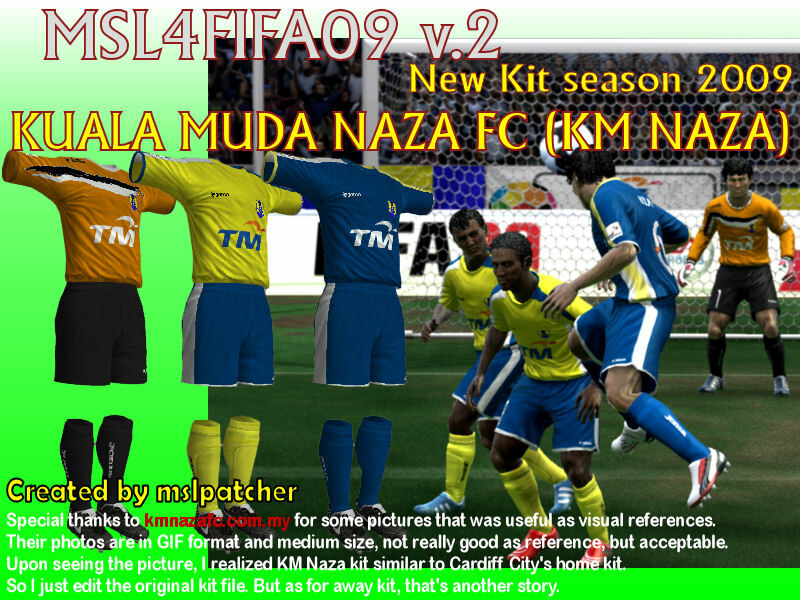 Should you interested in Malaysia Leagues for FIFA10 PC, then you're more than welcome to visit http://msl4fifa09.wordpress.com. Also all my patch works are listed in mslpatcher.wordpress.com. Consider the latter address as my Windows to the World or maybe in Bahasa, I can say Pintu Gerbang Dunia. thank you and join me to the world of Malaysia football, and other ASEAN countries too. 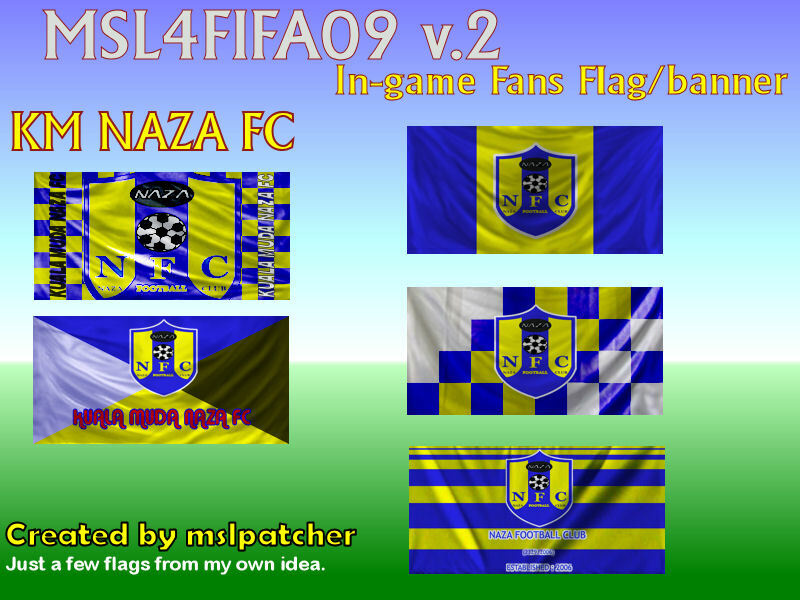 Today I've just release version 3 of MSLPL4FIFA09. It's been in my PC for quite a while now. In fact I play FIFA09 using this version, tweaking and setting up to my desires. I think I can release it now. I'm quite satisfied the new structure of the tournament and up to this point, it is ready for uploading. So alas , You too can download for your own please but be warn, IT IS NOT COMPATIBLE with previous version of MSLPL4FIFA09 PC patch. Simply means, it will overwrites the patch and then YOUR SAVE FILES WILL NO LONGER WORKS. This patch is meant for FRESH INSTALLATION ONLY. Don't ask me why your previous career file do not work. IT IS FOR FRESH INSTALLATION and fresh game experience. It is not because of me. It is how it works in FIFA09 and CM09. Please be inform that NO ONE CAN REPRODUCE or REUPLOADED THIS PATCH to other server especially Rapidshare.com. Don’t do that. Instead any blogs or websites, please give the link to this page/post instead, and not the file link itself. Unzip the file and BEFORE you do anything read MSLPL4FIFA09-README FILES. Read HOW-TO Tutorial documentation for proper instruction. Follow the guidelines. This is especially necessary for new user of CM09 and SM09. Consider this one as the final version prior to FIFA10. As usual, you will have all 28 teams, including MBJB FC just to make it in balance. Of course it is now far from realistic, since that team no longer in Premier League due to disciplinary action taken by FAM. But what can I say, fun is still the main factor. Also you still have DPMM FC in Rest of World. There is also a few surprise! Did I mention about new tournament? Yes? Well you need to see it for yourself. As for lineup, I don't change anything, so in terms of team and players, everything is similar to previous version. The only thing change in this version is the tournament setup. I hope you will ENJOY the game patch as I'm enjoying making it. 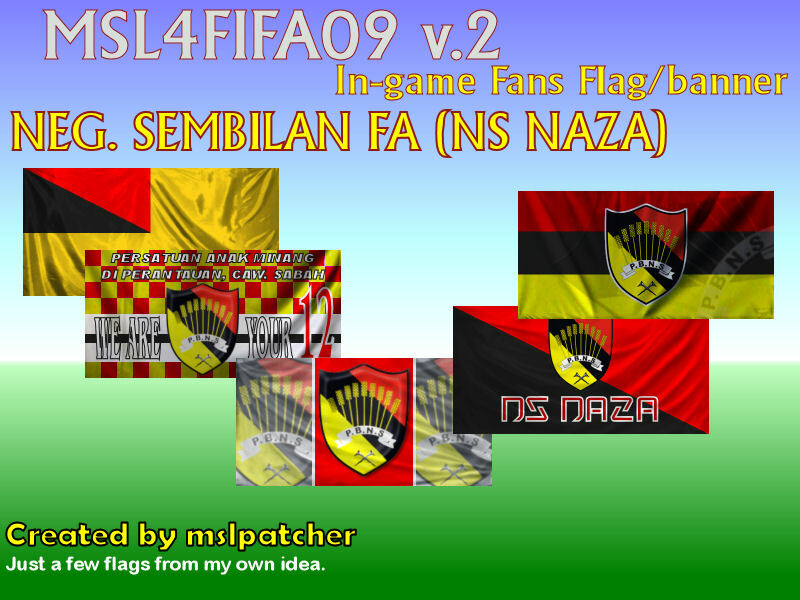 Malaysia Super League and Malaysia Premier League Patch for FIFA09 PC are now available for downloads. After much delays, I'm more than happy to release this patch for Malaysia football supporter and fans. Please be inform that NO ONE CAN REPRODUCE or REUPLOADED THIS PATCH to other server especially Rapidshare.com. Don't do that. Instead any blogs or websites, please give the link to this page/post instead, and not the file link itself. Unzip the file and BEFORE you do anything please read MSLPL4FIFA09-INFO-V2.PDF (link below) for instruction. Follow the steps carefully. This is especially true to newcomer/user of CM09 and SM09. Also please read MSLPL4FIFA09-CREDITS-V2.PDF for list of up-to-date credits. NOW ALL OF YOU CAN TRY TO WIN ALL FA CUP, LEAGUE CUP AND MALAYSIA CUP. CAN KEDAH FA BEAT THE ODDS AND BECOMES THE TREBLE WINNER AGAIN? YES THEY CAN IN REAL LIFE AND IN THE GAME. If you want convincing proof before downloading a big file above, you may first read the following information which is now VERSION 2 (including a new COMMENTARY INSTALLATION GUIDES AND UPDATED CREDIT INFO). If you already downloading the above patch file, please download the PDF file below for latest up-to-date information and guidelines. Thank you for downloading the patch and reading my Guidelines (or tutorial). PS : I WILL NO LONGER SUPPORT OR CONVERTING THIS VERSION FOR FIFA08. So, what team in this patch? Well, there are all here. All 28 team of Malaysia super league and malaysia premier league. Not to waste my previous work, I also includes DPMM FC from Brunei as Rest of World team and our malaysia national team. I really hope now all part of life will enjoy this patch eventhough it is far from perfect. I’m more than happy to make Sabah FA and our neighbor state, Sarawak FA. Now we can play and try to promote the team to Super League, while winning in FA Cup and Malaysia Cup. Give way for Sabah and Sarawak!!! Hmm, if only can i get a proper chants for these two team…. Here are two videos for your pleasure. I would like to announce officially the new release date. If everything goes as plan, all of you can download the latest version this coming weekend, i.e., 8th February 2009. 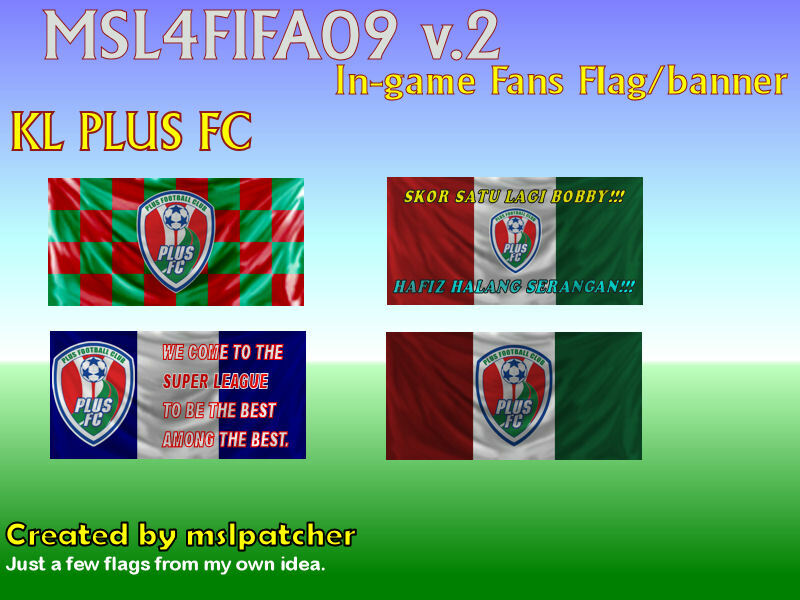 As you already aware, I have to postponed the release of MSL4FIFA09 and MPL4FIFA09, which collectively will be known as Malaysia League Patch for FIFA09 PC version 2 because I have yet to finish the patch. However, since I have to continue doing something else, I will have to just let it go just as it is. I will not able to give full jersey/kit for all MPL teams. Instead, I use KDM09 and simply create mix-n-match jersey for each team. As long as it good in the game, it's okay by me. The same thing with players line-up. I still can't find good information related to each teams' first eleven. Not even in any forum. There is a few but not enough. Time is running out. So forgive me if you favorite players plays in wrong position. I think I still have a few days to draw any team jersey if I can find a good pictures. 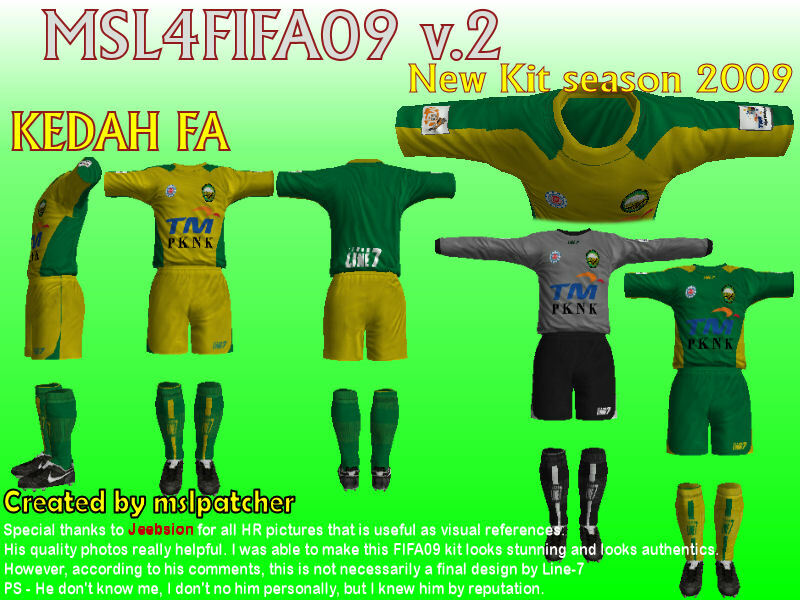 Even in the last a few days, I managed to draw the new kit for Kedah after gathers pictures from jeebsion website. Thank you Jeebsion for the HR quality pictures. Just now I browse akualtra.com. At last, they provide front-view pictures for Sabah (my states team) and Felda United FC original kit. So maybe I can draw Sabah team 2009 kits confirming the pictures, and maybe Felda U too before the release. So thank you for your passion. 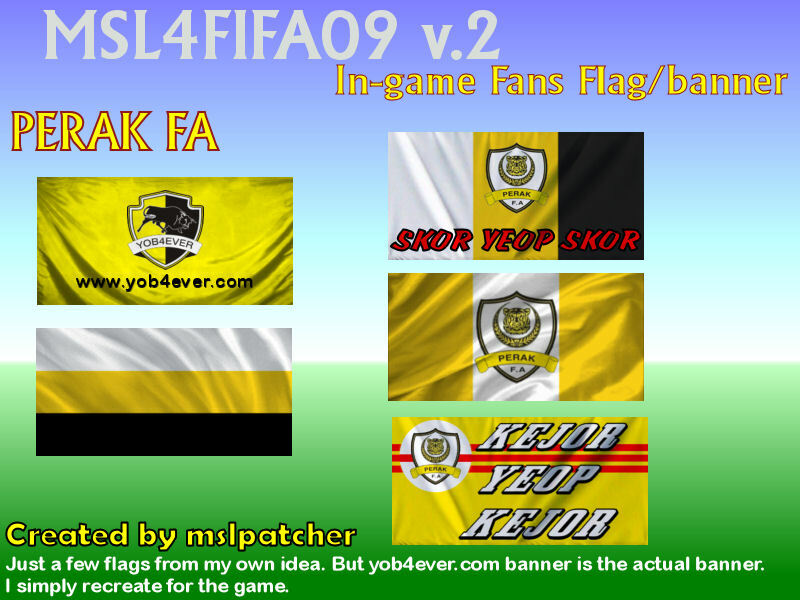 I have a few surprise for the fans of FIFA09 game and fans of MSL4FIFA09 patch. In the meantime, you see the new Kedah FA featuring in the 2nd version. 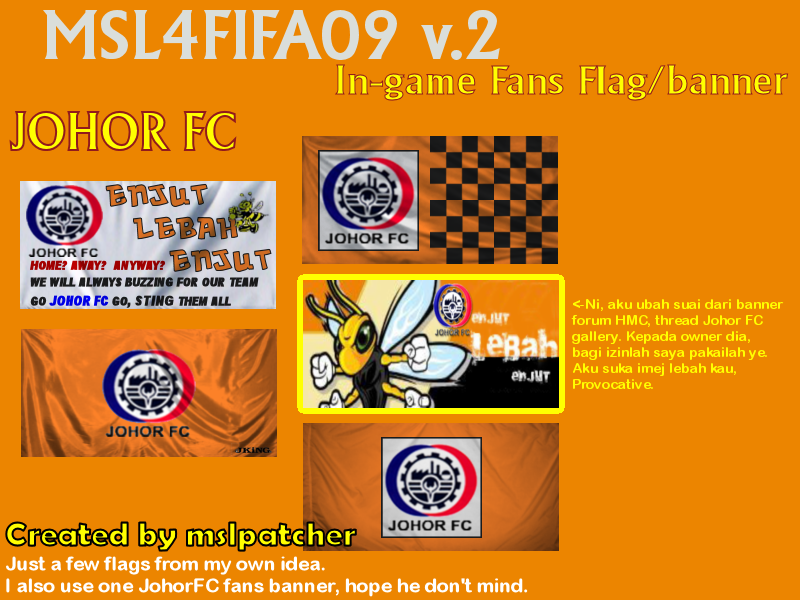 Liga Super Malaysia (Malaysia Super League) patch created by mslpatcher will be out soon. But I’m afraid it may not be as complete as I intend to do. On February I have to move to another project. Sadly I also will have to release Liga Perdana Malaysia (Malaysia Premier league) without proper jersey or kit as I don’t have any clue what they looks like. I don’t have pictures, and eventhough I try hard tracking down all websites possible. I can’t find a very good one. Even my state’s team, I don’t have a pictures. Anyway, this is a few additional visual-teaser for you guys as what to expect (the new and latest) for the rest of the team. I still don’t finished the graphical parts though, and luckily one person, Pejai is helping me with a few flags - PDRM, Terengganu, Pahang and UPB myTeam. Liga Malaysia musim 2009 - Malaysia League season 2009 comprises of Liga Super (tier one league) and Liga Premier (second tier league). In real live 14 teams compete in MSL and another 14 teams competing for silverware in MPL. For the fans of FIFA09 and those who love to play with Malaysia football scene in your PC you probably already notice or download and play MSL4FIFA09 pre-season 2009 (I later call it version 1). And I promised to deliver second version or release which incorporates changes happened before the real kick off. So far, I’m behind schedule since I can’t find a good helper and sources for all 28 teams. I managed to gather some helps from fellow HMC forumer like. Okay about the progress report. I know you would love to see the new jersey/kit of Liga Super team for this season. For a start, enjoy kit of Kelantan, Perak, Perlis, and KL Plus FC. BTW, I really-really hope all of you will enjoy the screen, I’m already excited. If you enjoy play with Malaysia Super league (Liga Super Malaysia) patch (MSL4FIFA09), then you might interested with this sound patch too. This is a small package of team chants in SMP format file. It comprises of Kedah and Selangor team only. I have a plan to release additional chants later on, if time permits and/or if I can find a good and reliable audio sources for other teams in MSL patch. 3. Sound Master already installed. Download Kedah and Selangor team chants here. All the audio sources were taken from some video that available freely in youtube, mostly a fan video. Unfortunately, not all youtube items related to malaysia football have a good sound/audio setup, as such, you may find that my patch is probably fall in mediocre sound patch category. But, hey, as long as you enjoy it. Better have the sound rather than nothing at all. Don't you think so? Perhatian: Saya mengambil sumber audio dari pelbagai video dari youtube tanpa kebenaran secara rasmi dari pemilik sah sumber video tersebut. Saya minta maaf jika ia melanggar prinsip atau hak penerbitan video anda. namun begitu, saya amat berharap, memandangkan saya tidak mengenakan sebarang bayaran pun dalam penyediaan audio untuk fifa09 ini, saya amat berharap pemilik video youtube tersebut tidak menghalang pengedaran audio patch ini. Tetapi jika anda (pemilik video) tidak bersetuju dengan tindakan saya, sila tinggalkan mesej atau emel saya dan saya akan dengan segera membuang fail tersebut dari pengedaran dari akaun mediafire saya. Apa-apapun saya amat berterima kasih kepada fan-fan bola sepak Malaysia yang menyiarkan video-video perlawanan bola sepak malaysia. Semoga usaha anda dapat diteruskan. Nothing interesting about me except that I want to recreate MSL to the games. I also want Malaysia national team play against other team AND WIN the match all the time. Impossible? Not in the game. I'm Malaysian by the way.